I'm a vegetarian who gives Christmas presents (unwanted I'm sure but tough) of SSPCA hedgehog homes and RED squirrel sanctuaries. I abhore the Tory hunting, shooting and drinking brigade (actually I just abhore Tories) but if they could kill (reasonably humanely but don't knock yourselves out) the introduced grey sqirrel I would gladly buy them an a stiff brandy. Now that the pots have thawed out, he or she is free to go looking for lilies, although his sense of smell is rubbish because it goes through EVERYTHING else first. My tray of Meconopsis betonicifolia "Hensol Violet" and M. Grandis looks like someone's buildinga swimming pool for fruit flies in it. It's out of focus to spare you the real horror as some viewers may find the follwing scenes offensive. It's not as if they even eat what they find (I've no idea what this is other than a bulb that puts up leaves every year, doesn't flower, and dies back. So I thought if it had a bit more room it might help. I hadn't taken vermin into account. I wouldn't mind so much, actually, on second thoughts, I would, mind if they ate anything but they are only after Lilies, And probably Nomocharis cos they're beautiful and expensicve which has led to some novel means of protection! 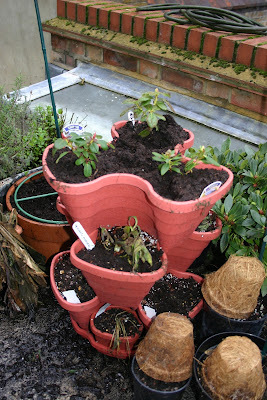 The fez's are actually coir pots I bought in a moment of environmental madness. They do the job though (each is sitting on a pot of Lilies, You can also see my plan for supporting the big, blousy hybrids I bought in a daze from de Jager or Van Meuwen. They do look rather splendid actually in the catalogue so hopefuly those green rings which rise up the cane with the growth will work with nature to keept them looking good. I''m going the underplant with Tropaeolum majus "Whirlybird", a semi-double which will take over once the Lilies pass and keep going until the first frosts. 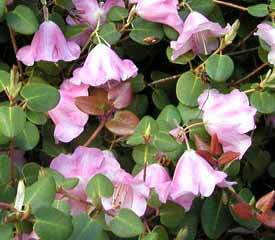 It will also require watering morning, noon and night. I managed to get this cane in without spearing the bulb in the middle ( think) and you can see how the support works, a bit more subtle than other methods but possibly useless when trying to support a 2m blaze of colour. You can't really see from this pic but the squirrel has been here too yet the shoots remain untouched and he'd have to go 6in down the get at a bulb. A lot of seedlings that were protected from rodents (are they rodents? Look like them) have carried on growing on the rare days when the temperature has passed 7C (the heat plants require to do their thing). 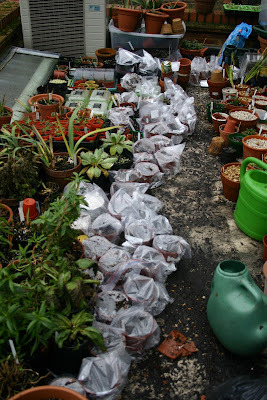 I've also sown a lot in the last few weeks and inserted them into Tesco freezer bags, just the right size! The idea is that this gives those that require stratification (a cold spell) to germinate will get it, hopefully, unless this grey, warm (in relative terms) carried on till March. Many species I have no idea what I'm doing but I find that actually, if you sow them, lightly cover them and are prepared to wait, most things will reward you. My Iris douglasiana hybrids and, hearteningly, as I've many other species of the genus to sow, the glorious Gladiolus tristis have just carried on through and the Lewisia Cotyledon hybrids have actually increased, despite my dreadful seed distribution! 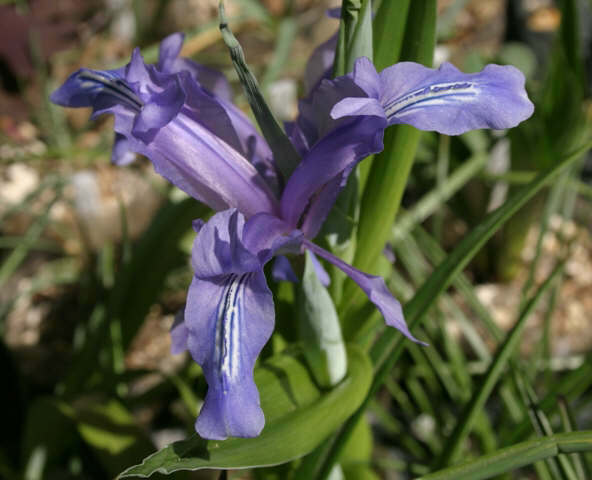 Iris douglasiana hybrids lookin' good! Gladiolus tristis, by the hundred! I have a new plan to try to cram more species into my tiny space and it involves something sold to me as a srawberry planter but there's no laws that says you can't fill it with Primulas, Irises, Rhododendrons, Corydalis, Tricyrtis and, when it warms up a bit, the centrepiece: Tropaeolum incisum. Okay, it's not very pretty at the moment but it has just been planted up specimens right in the middle of their hibernation! When the Primula waltonii, Iris lacustris and collettii, Corydalis flexuosa etc settle in and bulk up, the plastic will less obvious. Especially when the the mini Rhodies on the top layer (williamsianum, "Wee Bee" and "Snow Lady" are joined by my (almost) literal crowning glory. So with this tumbling down fron the centre of the top after most of the other inhabitants have done thing. Tropaeolum incisum. Bit more specieal than your average nasturtium! It looks like this at the moment, all snug in the greenhouse (although being from the high Andes it is meant to be hardy but I wasn't taking any chances with the winter's unpredictability! 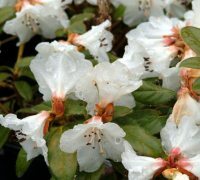 In a few years the Rhododendrons will have out-grown their current home, it remains to be seen whether the Tropaelom is still with us, we'll just ahve to wait and see!. And most of the junos are showing signs of life. Aucheri and bucharica were left outside over the winter, in very well-drained conditions and aucheri has broken through the papery protection at the growth tip. Bucharica is a bit slower but was only planted a bout 6 weeks ago. Other green popping up: Iris danfordiae (slowly) and Notholoirion thomsoniana (actually it's been up for months). And that's not everything but it's all the Lilies, I think, cos we're getting quite obscure now. And it means I'll have a few surprises for you later in the year! Great display - even of the "trouble spots". 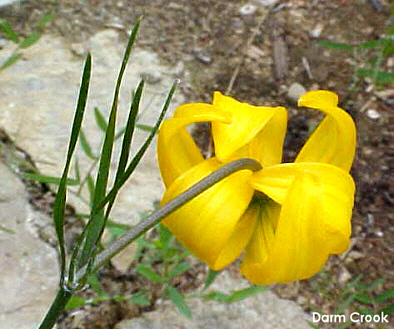 I am interested in lilies and was wondering if your L. p. Yellow Bunting is a new plant or is it old enough to have produced seeds! I would be interested in getting some seeds if that were ever possible. Here is a link to my blog with links to my lily stuff (still in the works). The Gift of Life, and When Do I Give It?